It can be hard to tell if the remote, self-contained worlds in a Ben Rivers film are postapocalyptic or prelapsarian, if the people in them are anticipating or have survived the fall. Much like the visionary author J.G. Ballard, for whom an ending always meant the possibility of a beginning, Rivers, a rising star of experimental cinema and one of the most distinctive filmmakers around, suggests that one man's dystopia may very well be another's utopia. In his 2008 short "Ah Liberty!" vaguely feral children roam across a junk-strewn rural terrain. The hero of The Origin of the Species (2008) is a forest-dwelling recluse, seen fiddling with jerry-built contraptions and heard riffing on Darwinian theories. Slow Action (2010) pairs semi-documentary footage of four distinct locales (including the Polynesian island of Tuvalu and Rivers's birthplace of Somerset in England) with a deadpan voice-over that imagines them as mysterious civilizations of the future. "Everywhere new utopias are possible," a narrator declares, even while reminding us that utopia literally means "no place." In much of his earlier work - he has produced more than 20 short and medium-length works in the past decade, moving between the cinema and the gallery - Rivers used a wind-up Bolex camera that only permitted relatively brief shots and encouraged a fragmentary, allusive approach to editing. The shots in Two Years at Sea are held longer, the rhythms more contemplative. In this virtually wordless film, Jake doesn't interact with anyone but he's actively engaged with the heaps of miscellaneous objects around him. We see him immersed in both manmade and natural surroundings, absorbed in labor and leisure: felling a tree, rummaging through his clutter, taking long walks and frequent naps, turning plastic tubs into a makeshift raft, and in the remarkable closing shot, simply staring, for minutes on end, at a slowly extinguishing fire. Rivers's methods here have much in common with the long-take minimalism of, say, Béla Tarr or Lisandro Alonso, but his austerity is leavened by a gentleness of tone, a generosity of spirit. For Rivers, one suspects, Jake is a kindred soul of sorts - or at any rate, an ideal match for a DIY filmmaker who is often his own one-man crew and whose unmistakably handmade films are tributes to self-sufficiency. (In The Origin of the Species, Rivers evoked the birth of the universe with a close-up of tomato sauce in a pan.) Like many avant-garde filmmakers before him, Rivers revels in the materiality of the medium. His films are punctuated with deliberate overexposures and he often develops his footage in his kitchen sink, a tactile process that leaves textured imperfections on the image and becomes a marker of the filmmaker's presence. Two Years at Sea is also the culmination of Rivers's longstanding project of portraiture by other means. (See also his 2012 short "Phantoms of a Libertine," an elegy for a departed friend pieced together from photographs and keepsakes he left behind.) His portrait films afford an intimate and very particular view of a person through the objects that surround them, the spaces they inhabit, the environments they have molded and that have molded them. Two Years at Sea offers next to no information about Jake, no reasons for why he lives the way he does, though the occasional glimpses of old photographs hint at a previous life, as does, perhaps, his eclectic taste in music (Indian raga, English folk). The title - never explained - is an oblique reference to his past as a merchant seaman. As richly imagined as it is closely observed, Two Years at Sea lies somewhere between documentary and daydream; at times, as when a caravan appears atop a tree, the film seems to slip into pure fantasy. Rivers's reference points are wide-ranging - he often toys with horror and science-fiction tropes, and it was the Norwegian author Knut Hamsun's Pan that partly inspired his search for modern-day hermits. But more and more, his work stems from a strong documentary impulse - a curiosity about real people and real places. 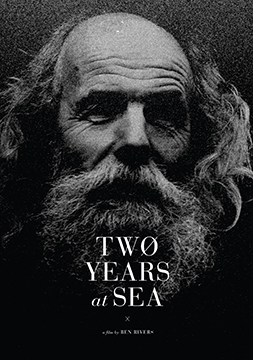 Two Years at Sea may bear little resemblance to documentary as we know it today, but it can claim a kinship with the form's earliest innovators, not least Robert Flaherty, John Grierson, and Humphrey Jennings, who were less interested in factual representations than with a poetic transformation of reality. Much like the people in his films, finding other ways of living on the margins of civilization, Rivers is staking out his own borderless zone, combining elements of portraiture, landscape film, ethnography, and travelogue while largely ignoring the rules of each genre. But in reaffirming the longstanding connection between experimental and documentary film, his work also represents a return to first principles. In his otherworldly dispatches from this very earth, we're reminded of cinema's eternal attraction to the real, and of the possibility that the fantastic exists within it. Dennis Lim is the director of cinematheque programming at the Film Society of Lincoln Center. He has written for numerous publications, including The New York Times, The Los Angeles Times, Artforum, and Cinema Scope.